Steamy Java cup on a quiet, crisp morning is about perfect start of the day in wilderness and a warm meal at the end of long trek is quite tough to beat as well. Camping or backpacking stoves can boost your wilderness adventure just like few other necessary tools can. Wood stoves are essential for survival. Either you are at home with no gas because of hurricane or blizzard or you are on camping trip and you are in need for easy and quick cooking. 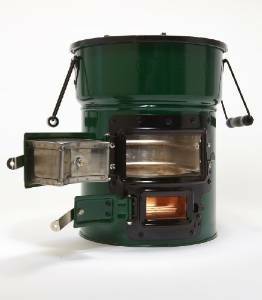 Good news is that camping wood stoves or backpacking stoves have become increasingly convenient and light in past few years. This means you will be able to spend lot less time to cook your meal and your pack will also stay nice as well as light too. 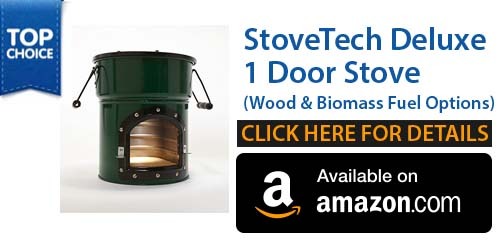 Bad news is that there are 100s of backpacking and wood stoves to choose from than ever before. This can makes it difficult for you to choose the perfect one. Here we tested and reviewed 6 top Camping Wood Stoves to help you cut through the clutter and choose the best stove available that better suits your trips’ needs and wants. 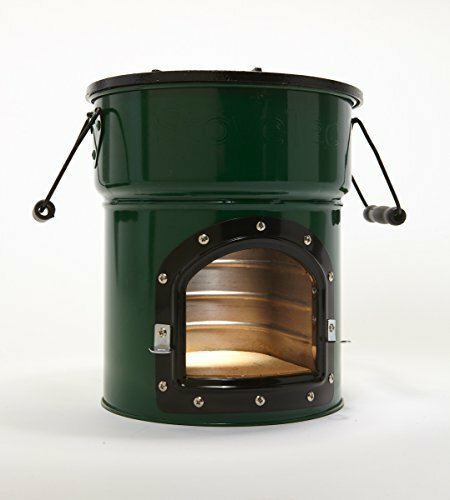 Stovetec 2 – Door Deluxe Lite has improved refractory metal chamber as well as pot skirt. 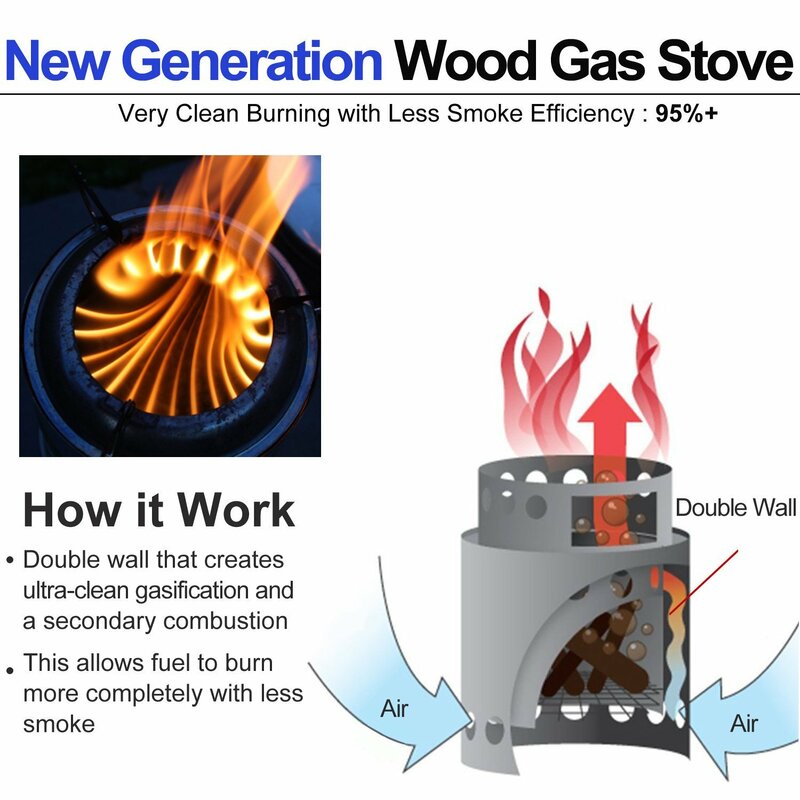 It’s so well designed to burn wood, charcoal fuel and biomass. It is durable, long lasting, safer to use and easy to operate. It includes fuel shelf & upgraded adjustable pot skirt to be used for boiling. Dimensions – Depth 11in., Height 12.5 in. It Burns Efficiently – It boil one pan of water in just 5 minutes as well as cook a many hot dogs on its circular grill exactly on the flames. It Burns all Combustible Biomass – It requires no purchase or transportation of fuel. It burns grass, dung, sticks, pinecones and all other types of biomass fuel. It is heavy – It is steel encapsulated ceramics and it weigh 28 lbs, which can be quite heavier to make portable for any type of fun camping other than camping aided by a transport or car. You Need to save it from getting wet – Not confirmed it is to protect steel sheathing, pot cover, or ceramic insert, however it is mentioned seriously. So you cannot leave it out and you must take extra care while tailgating or camping and prevent it from being wet. It has improved refractory metal combustion chambers door and Pot skirt. It burns biomass or wood and has many new improved features. It has a fuel shelf and an upgraded adjustable pot skirt for the purpose of boiling. It is safe to use, easy to operate and long lasting. 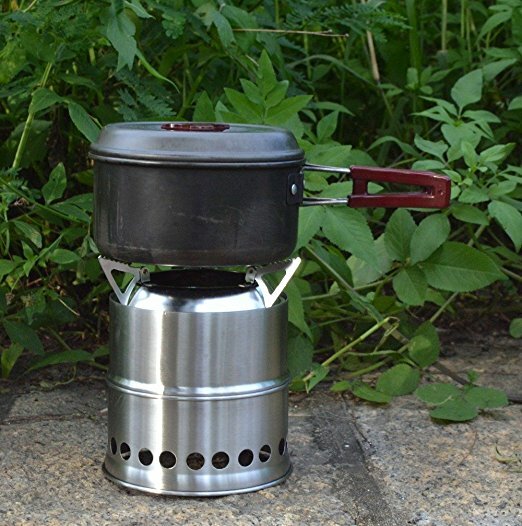 Light in weight – Only 14 lbs, makes it most effective portable stove for all types of camping. Burns all types of Combustible Biomass – It requires no purchase or transportation of fuel. It burns grass, dung, sticks, pinecones and all other types of biomass fuel. You must be careful for a Longer Fire – To maintain very fast boil for an hour or long, you need to keep cleaning waste to maintain the fire. It’s awesome and you can use sticks and other combustible biomass like grass also. It takes few minutes to setup. Its small mesh bag is amazing, which makes it easy to carry and keep together. It can be kept in a bug out bag or backpack. It work well for emergency and to keep in your car. It works faster than wood or charcoal fire. Its design is good as it fits into a large piece. It’s safer than regular campfire as burning fuels are contained inside it and not kept on ground directly. Putting fire out is also easier, just pour some water on it. Burns 25 oz. water in just 6 minutes and fry vegetable in just 8 minutes. Extremely stable pot, 3 arms pot supporting system for stable cooking which distributes even heating. Slightly discolor and soot your pot – Slightly soot discolor the pot but it isn’t a big problem. Smoke – It does smoke, but it is a manageable problem. It lit without any problem even in winds like 15 mph. Just take 10 minutes to boil water and fuel burned up to 25 minutes before its flame died and it flame right up again by throwing few more twigs or stick. 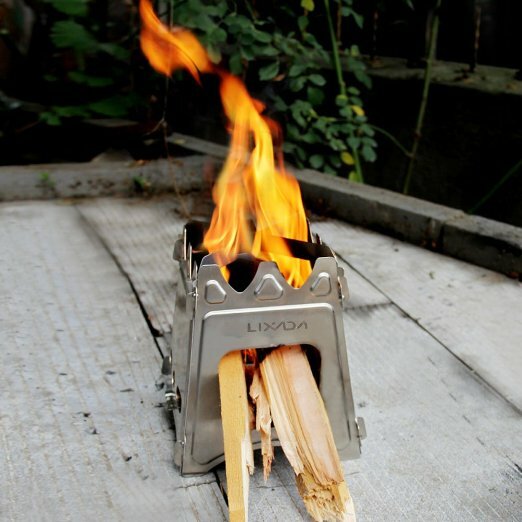 It burn well for more than an hour by feeding fuel before ashes build to point where it needs cleaning. You don’t need to carry cans of fuel. Just introduce a two char-coal or a briquette and it will keep heat for longer period of time. The higher fuel density, longer will be the burning time. When it is full of dry fire wood, it can burn for 20 minutes or long. Built To Be Tough. 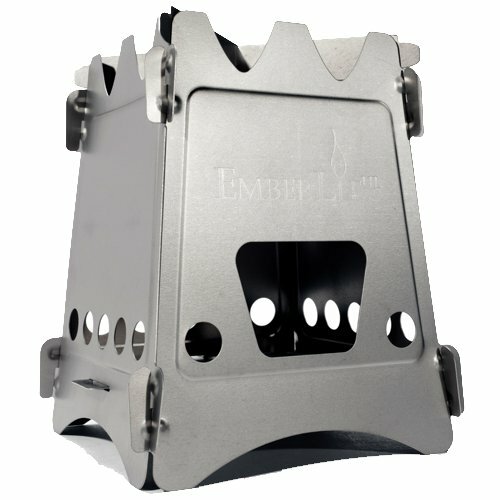 It is made from hard stainless steel and durable to keep it without any care. Low Price – A good bang for your bucks. 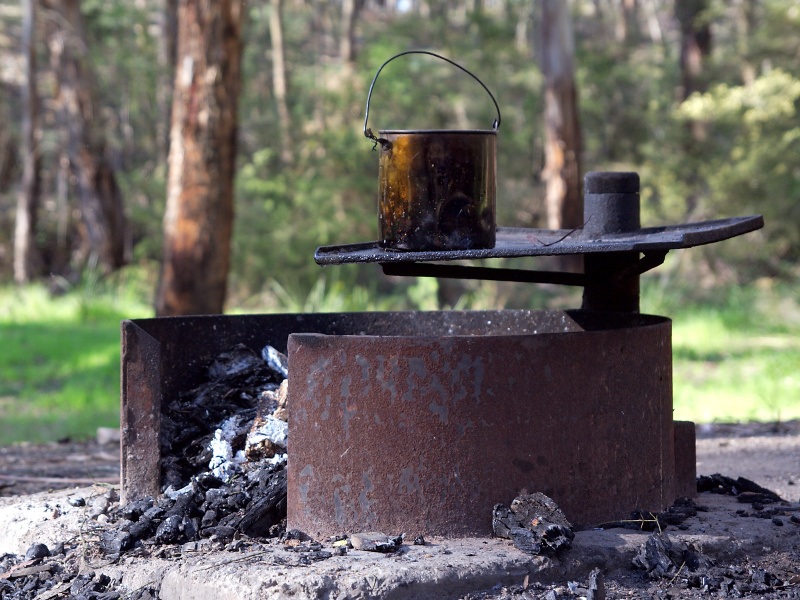 No Solid Bottom – It lacks a solid bottom, therefore when setup on forest floor, picnic table, or any other surface it may drops embers drop downs and hot ashes. Not Suitable for burning larger meals – It is so small so you cannot put heavy pots on it or can cook larger meals on it. Use small pan to fry eggs and bacon or the like or just boil small amount of water. It’s cheap yet good if not better than other costly options. It comes with carry case that fit some lighter and matches inside it. Protective cover on stainless pieces is easy to remove. However it is rock solid when you assemble it. Its sturdiness makes it worth carrying extra weight and it sat on and yet not collapse under high pressure. Air holes on sides and bottom of pan create fire which burns fast and hot. It’s larger, however not too large to carry. It is thick and sturdy. It is intuitively construct and well designed. With cross bar design on top it fit smallest bottle, pot or cup in the kit. You can pack it up in its small sleeve bag with ease. It is great for backpacking, however it is heavier, so it isn’t suggested for those who want something extra light. Burns all types of Combustible Biomass. It requires no purchase or transportation of fuel. It burns grass, dung, sticks, pinecones and all other types of biomass fuel. It’s crazy fast – Boil 500ml water in 4 minutes or less. Cheaper Yet Good Quality – Good bang for your bucks, at this price it still be compareable with EmeberLit. It weigh less than 5.45 oz, and best for those who really pay attention to light weight camping gigs. It is made from purest titanium, it is a stronger device that is impervious to corrosion because of stainless steel material. With individual panels which make up Emberlit may take on slight wrap, which is usual and does not affect durability or assembly of it. Although it comes with lifetime warranty, you never find any tear or wear out of it. Lightweight and convenient to carry – It is compact and portable and the fact that you don’t need to carry any fuel with you makes it amazing. Even it packs flat more convenient to carry. Least amount of smoke – No one likes smoke as it annoys and technically it waste lots of fuel. Expensive – As compared to other stoves out there, it is quite expensive however to be proud to use something made with Titanium and made in USA you have to spend more. Regulate temperature – This is a real failure of this device, however not a big deal. Well not suitable to cook a steak.